Combining a precision optic with a full-featured GoTo mount, plus a suite of useful accessories, the iOptron Photron 150mm f/9 Ritchey-Chretien Catadioptric GoTo EQ Telescope is a complete system ideally suited for visual observation or astrophotography. Mounting the superior optics of the RCT on a fully motorized equatorial mount allows users to accurately track objects for long periods of time without the field rotation that happens when using alt-azimuth mounts. Without the field rotation, long exposure times of several minutes can be used without star streaking or blurring. Added to the OTA, mount, and sturdy tripod, iOptron includes a precision electronic focuser, an eyepiece and diagonal, and a finderscope and bracket. 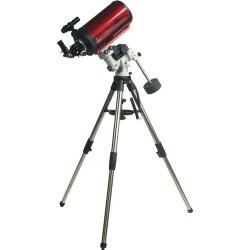 Utilizing the same hyperbolic primary and secondary mirror design used in the Hubble Space Telescope, the Keck telescopes, and the ESO Very Large Telescope, the iOptron Photron 150mm f/9 Ritchey-Chretien Catadioptric Telescope is ideally suited for both star-gazing and astrophotography. Its relatively compact size allows it to be used on smaller mounts while delivering views that are free from off-axis comas, or spherical and chromatic aberrations. The low thermal-expansion quartz primary and secondary mirrors are treated with highly-reflective dielectric coatings that, when combined with internal knife-edge baffles, limit distortion as the mirrors heat while limiting stray internal light and maximizing light transmission. All this translates to bright and sharp high-contrast images with accurate color fidelity across the entire distortion-free field of view. Unlike other catadioptric designs, this RCT has a fixed primary mirror to eliminate the image-shift that is common with conventional configurations that move the mirror forward and back to focus the image. With the primary mirror fixed in-place, iOptron installed a precise two-speed Crayford-style focuser with a 10:1 reducer that allows for fast coarse and precise fine focusing without the backlash that occurs in the more common rack-and-pinion design - essential for astrophotography or splitting objects that are close together, like binary stars. To ensure complete coverage of today's imaging sensors, the focuser has a 2" drawtube and comes with three extension rings to help users achieve the proper back-focus distance. The larger drawtube also allows the use of large eyepieces which generally have longer eye reliefs to make visual observations much more comfortable; and comes with a 1.25" reducer to enable the smaller and more common-sized eyepieces and accessories to be easily used. With improved tracking accuracy thanks to its new low periodic error of less than ±10 arcsec, and larger gear switches on both axes to make access and adjustments easier the iOptron CEM25P Equatorial GoTo Mount makes an ideal mount for most astronomy and astrophotography needs. It includes the motorized mount, the Go2Nova 8408 computer hand controller, a tripod upgrade to a sturdier 2" model, and the AccuAlign illuminated polar scope. Its built-in 32-channel GPS receiver transmits accurate date, location, and time to the hand controller, so when you change your position, the telescope can be set up quickly with accurate information. For precise tracking, as required during long-exposure astrophotography or observation sessions, the CEM25P has the capability for you to program out the Periodic Error Correction (PEC) common to all worm gears. With a maximum payload capacity of up to 27 lb, this mount is ideal for most medium to large refractor, reflector, or catadioptric OTAs with Vixen-style dovetail plates, while still being able to handle imaging rigs. The stepper motor is controlled by the Go2Nova hand controller. This system has an internal database of 150,000+ celestial objects, multiple alignment assistance procedures, and updateable firmware through the built-in serial port. With nine slew speeds and automatic tracking capabilities, finding and keeping objects centered in the field of view is easy whether you're viewing the fast-moving Moon or much slower deep space subjects. Adjustable height from 30" - 52"
Eliminate vibrations and achieve finer and more precise focusing on your 6, 8, or 10" Photron Ritchey-ChrÃ©tien telescope with iOptron's Electric eFocuser. Once installed on the OTA, the unit plugs into the auxiliary port on compatible mounts for power, and allows it to be controlled using the Go2Nova computer hand controller running the current firmware version. A precise stepper motor with a synchronous drive belt delivers three speeds — low, medium, high — without vibration or noise. While the eFocuser is primarily designed for the iOptron Photron Ritchey-ChrÃ©tien series telescopes, it will also fit other RC scopes such as GSO, OPT's TPO, Astronomics' Astro-Tech, and Orion; it may work with other RC scopes that use the similar dual-speed focuser. Designed to be lightweight and durable, the diagonal features an aluminum housing with a black anodized finish. The 1.25" barrel and eyepiece holder makes it compatible with the most popular size focusers, drawtubes, and accessories; and the brass compression ring in the eyepiece holder ensures your eyepieces won't get marked or marred when locked into place. An internal integrated safety stop in the eyepiece holder protects the mirror and ensures a long life. With a wide field of view and low-profile aperture, the iOptron 6x30mm Finderscope is an ideal finder for star-hopping navigation that won't add excessive weight or bulk to your OTA. It comes with its own bracket that is outfitted with a dovetail mount for compatibility with a wide array of finder saddles, and three thumbscrews that enable precise alignment with the OTA.